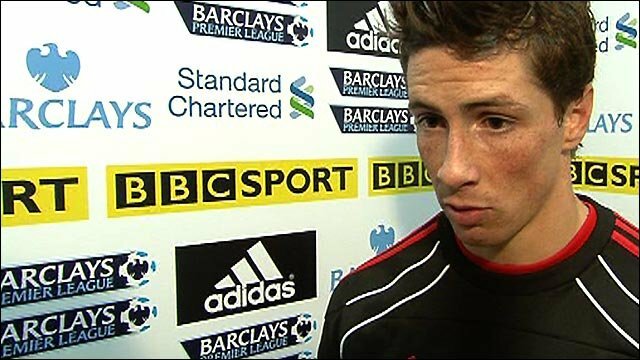 Liverpool's rejuvenation continued as two moments of brilliance from Fernando Torres sank Premier League leaders Chelsea at Anfield. Torres, who has struggled for form and fitness since the 2010 World Cup finals, was back to his best to torment Chelsea once more, ensuring the champions' lead at the top of the table remained at two points and Liverpool rose into the top 10 with a third successive league victory. The Spain striker opened the scoring early on with a finish of rare finesse and added his second a minute before the break with a magnificent curling effort past Chelsea keeper Petr Cech to make it seven goals in eight games against the west Londoners. Reds boss Roy Hodgson's side then defended their lead doggedly in the face of a renewed challenge from the visitors after the break, helped by the belated introduction of Didier Drogba, who had been suffering from a fever and was restricted to the substitutes' bench in the first half. Chelsea badly missed the influence of midfield pair Frank Lampard and Michael Essien, and Liverpool's feverish work-rate, allied to the Torres's outstanding finishing, earned them three points that was celebrated ecstatically on The Kop. 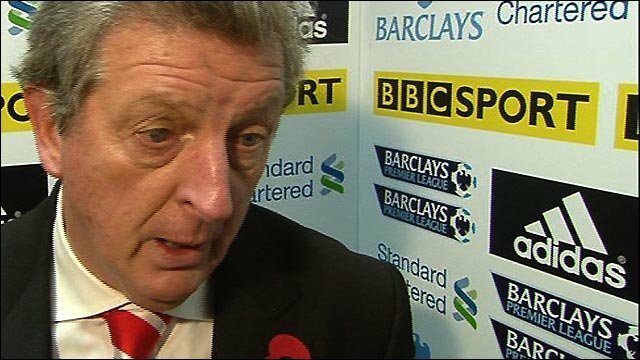 Hodgson will be starting to feel his reign, so troubled and turbulent early on as they dropped into the relegation zone, is now clicking into gear - although there is still so much work to be done, and confidence is still a rebuilding process judging by the needless retreat into negativity for periods of the second half. The 63-year-old's Chelsea counterpart Carlo Ancelotti will reflect on a display that never kicked into life until the second half, when Liverpool keeper Pepe Reina saved brilliantly from Florent Malouda before diverting Nicolas Anelka's shot on to the bar in a frantic finale. Ancelotti had to leave Drogba on the bench, and the Ivorian was sorely missed as he was forced to watch Liverpool's master marksman Torres provide all the quality in the first 45 minutes. The Blues boss cut a frustrated figure in his technical area as his team's lifeless display was punished ruthlessly by Torres. Dirk Kuyt's return after an ankle injury not only provided the home side with greater endeavour but also invaluable support for Torres, and it was those two forwards who combined to carve through Chelsea's defence after 11 minutes. Torres's first touch was perfect as he collected Kuyt's clever pass and the Spaniard's finish was of equal quality as he lifted the ball over Cech. Reina was virtually unemployed in the first 45 minutes as Chelsea failed to mount any serious threat, and it was another moment of magic from Torres that doubled the lead on the stroke of half-time. Raul Meireles won possession from Ashley Cole in midfield, and when the Portuguese midfielder found Torres, the Spaniard curled a stunning finish into the only space available to send Anfield into ecstasy. 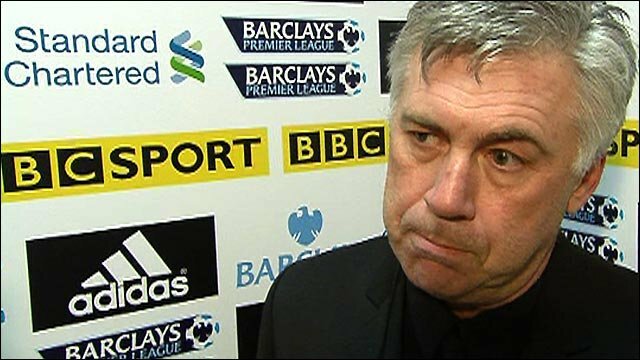 Ancelotti responded by introducing Drogba for the second half at the expense of Salomon Kalou - and the effect was obvious, helped by Liverpool's obvious desire to hold on to what they had. In a spell of sustained pressure from the Blues, Ramires headed Cole's cross over the top when he should have done better and Reina saved well from Yuri Zhirkov's powerful angled effort. As the visitors applied the pressure, Reina came to Liverpool's rescue with a crucial reaction save from Malouda as he stole in on the end of Drogba's cross. Liverpool almost increased the lead with 15 minutes left when the men from Stamford Bridge could only half-clear a corner and Cech diverted Kuyt's effort away with his legs. Chelsea's last chance came and went when Reina turned Anelka's shot on to the bar, leaving Anfield in full voice as Liverpool celebrated a vital win. 83:05 The ball is delivered by Ashley Cole, Headed effort from the edge of the area by Daniel Sturridge goes wide of the right-hand upright. 82:19 The ball is delivered by Ashley Cole, clearance by Martin Skrtel. 81:46 Jose Bosingwa delivers the ball, save by Jose Reina. 81:21 Corner taken by Florent Malouda from the right by-line played to the near post, clearance by Dirk Kuyt. 81:14 Jose Bosingwa sends in a cross, clearance by Martin Skrtel. 80:19 Corner from the left by-line taken by Florent Malouda, clearance made by Leiva Lucas. 80:13 A cross is delivered by Nicolas Anelka, Steven Gerrard manages to make a clearance. 79:11 Jose Bosingwa crosses the ball, clearance by Martin Kelly. 78:27 Foul by Fernando Torres on Ashley Cole, free kick awarded. Mikel takes the free kick. Correction - 77:46 Shot from 18 yards from Daniel Sturridge. Save made by Jose Reina. 77:46 Daniel Sturridge takes a shot. Save made by Jose Reina. 77:34 Centre by Didier Drogba. 76:10 Handball decision goes against Raul Meireles. Ramires restarts play with the free kick. 75:09 Free kick awarded for an unfair challenge on John Terry by Dirk Kuyt. Ashley Cole takes the direct free kick. 75:09 Substitution Daniel Sturridge is brought on as a substitute for Yury Zhirkov. 74:01 Steven Gerrard takes a inswinging corner to the near post, clearance by Didier Drogba. 73:47 Dirk Kuyt has an effort at goal. Save made by Petr Cech. 73:15 Corner taken right-footed by Steven Gerrard, Alex makes a clearance. 71:31 Free kick awarded for a foul by Dirk Kuyt on Alex. Jose Bosingwa takes the direct free kick. 71:15 Shot from 25 yards from Rodriguez Maxi. Save made by Petr Cech. 70:25 Ashley Cole gives away a free kick for an unfair challenge on Dirk Kuyt. Free kick crossed by Steven Gerrard, clearance by Didier Drogba. 69:42 Foul by John Terry on Dirk Kuyt, free kick awarded. Jose Reina restarts play with the free kick. 69:42 Substitution Jose Bosingwa is brought on as a substitute for Branislav Ivanovic. 68:57 The ball is sent over by Branislav Ivanovic, clearance made by Martin Skrtel. 65:45 Free kick awarded for an unfair challenge on Raul Meireles by Ashley Cole. Direct free kick taken by Jose Reina. 65:04 A cross is delivered by Didier Drogba, Florent Malouda takes the chance to get an effort at goal. Save by Jose Reina. 63:17 Free kick awarded for a foul by Ramires on Leiva Lucas. Jamie Carragher restarts play with the free kick. 63:11 Ashley Cole crosses the ball, save by Jose Reina. 62:44 Free kick awarded for an unfair challenge on Branislav Ivanovic by Rodriguez Maxi. The free kick is swung in right-footed by Ramires. 61:40 Centre by Florent Malouda, Paul Konchesky makes a clearance. 61:06 Corner taken left-footed by Florent Malouda from the left by-line to the near post, Dirk Kuyt makes a clearance. 60:52 Shot by Yury Zhirkov. Save made by Jose Reina. 60:06 Outswinging corner taken left-footed by Florent Malouda, Fernando Torres manages to make a clearance. 59:19 The ball is sent over by Ashley Cole, Header on goal by Ramires from inside the box goes harmlessly over the target. 57:03 Martin Skrtel challenges Didier Drogba unfairly and gives away a free kick. Strike on goal comes in from Didier Drogba from the free kick. 55:44 Free kick awarded for an unfair challenge on Mikel by Fernando Torres. Free kick taken by Mikel. 54:54 The assistant referee flags for offside against Florent Malouda. Jose Reina takes the indirect free kick. 54:34 A cross is delivered by Florent Malouda, Paul Konchesky makes a clearance. 53:46 Unfair challenge on Yury Zhirkov by Steven Gerrard results in a free kick. Florent Malouda delivers the ball from the free kick left-footed from left wing, clearance made by Leiva Lucas. 51:19 A cross is delivered by Branislav Ivanovic, clearance by Martin Kelly. 48:51 Free kick awarded for a foul by Florent Malouda on Leiva Lucas. Free kick taken by Jose Reina. 48:40 A cross is delivered by Raul Meireles, save by Petr Cech. 47:57 Ramires sends in a cross. 46:27 Unfair challenge on Jamie Carragher by Didier Drogba results in a free kick. Jose Reina restarts play with the free kick. 46:16 Rodriguez Maxi has a drilled shot. Petr Cech makes a comfortable save. 45:21 The offside flag is raised against Fernando Torres. Alex takes the indirect free kick. 45:01 Substitution Didier Drogba replaces Salomon Kalou. 45:00+1:06 The ref blows to end the first period. 45:00+0:08 The assistant referee signals for offside against Nicolas Anelka. Indirect free kick taken by Jose Reina. 43:59 The assist for the goal came from Raul Meireles. 43:59 GOAL - Fernando Torres:Liverpool 2 - 0 Chelsea Fernando Torres fires in a goal from just outside the penalty box to the top right corner of the goal. Liverpool 2-0 Chelsea. 43:06 Foul by Florent Malouda on Martin Kelly, free kick awarded. Direct free kick taken by Jamie Carragher. 42:00 Foul by Nicolas Anelka on Jamie Carragher, free kick awarded. Free kick taken by Jose Reina. 40:02 John Terry gives away a free kick for an unfair challenge on Fernando Torres. The free kick is swung in right-footed by Steven Gerrard, Ramires makes a clearance. 38:43 Corner taken left-footed by Yury Zhirkov to the near post, clearance by Steven Gerrard. 38:31 Florent Malouda has an effort at goal. Blocked by Jamie Carragher. 37:40 The offside flag is raised against Dirk Kuyt. Alex takes the free kick. 37:07 Ramires gives away a free kick for an unfair challenge on Rodriguez Maxi. Jose Reina takes the free kick. 35:57 Free kick awarded for an unfair challenge on Martin Skrtel by Salomon Kalou. Jose Reina takes the free kick. 35:23 Fernando Torres concedes a free kick for a foul on Mikel. Free kick taken by Mikel. 34:11 Leiva Lucas gives away a free kick for an unfair challenge on Florent Malouda. The ball is sent over by Florent Malouda, Alex has a headed effort at goal from just inside the penalty area that misses to the right of the goal. 32:18 Free kick awarded for a foul by Dirk Kuyt on John Terry. Direct free kick taken by Petr Cech. 32:08 Effort from 20 yards by Martin Kelly. Blocked by John Terry. 29:23 The official flags Nicolas Anelka offside. Jose Reina takes the indirect free kick. 28:01 Raul Meireles has an effort at goal. Save by Petr Cech. 27:48 Dirk Kuyt sends in a cross, clearance by John Terry. 27:24 Leiva Lucas fouled by Florent Malouda, the ref awards a free kick. Raul Meireles takes the direct free kick. 25:38 Steven Gerrard challenges Ramires unfairly and gives away a free kick. Ramires takes the direct free kick. 23:22 Free kick awarded for a foul by Fernando Torres on Alex. Direct free kick taken by Petr Cech. 22:41 Unfair challenge on Steven Gerrard by Ramires results in a free kick. Steven Gerrard restarts play with the free kick. 20:45 Effort on goal by Rodriguez Maxi from just inside the area clears the bar. 19:42 Foul by Yury Zhirkov on Leiva Lucas, free kick awarded. Steven Gerrard delivers the ball from the free kick right-footed from left channel, John Terry manages to make a clearance. 19:42 Booking Yury Zhirkov goes into the referee's book for unsporting behaviour. 18:24 Unfair challenge on Salomon Kalou by Fernando Torres results in a free kick. Ashley Cole takes the free kick. 13:52 Raul Meireles produces a cross, Alex makes a clearance. 13:22 Free kick awarded for an unfair challenge on Fernando Torres by Alex. Free kick taken by Steven Gerrard. 13:00 The ball is swung over by Ashley Cole, Salomon Kalou takes a shot. Save by Jose Reina. 12:04 Fernando Torres produces a right-footed shot from just outside the penalty box that misses to the left of the target. 10:52 Assist by Dirk Kuyt. 10:52 GOAL - Fernando Torres:Liverpool 1 - 0 Chelsea Goal scored by Fernando Torres from inside the six-yard box to the bottom left corner of the goal. Liverpool 1-0 Chelsea. 4:05 Unfair challenge on Raul Meireles by Yury Zhirkov results in a free kick. Free kick crossed right-footed by Steven Gerrard, Mikel manages to make a clearance. 2:10 Martin Kelly gives away a free kick for an unfair challenge on Yury Zhirkov. Free kick crossed left-footed by Florent Malouda, clearance by Steven Gerrard.